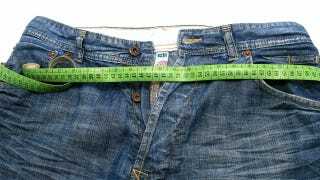 Some scientists think Body Adiposity Index will replace BMI as a measure of obesity. But it may have some of the same problems. According to Liz Neporent of ABC, BAI is calculated based on height and hip circumference, while BMI uses height and weight (the curious and tape-measure-armed can determine their BAI here). Experts think the new measure might be better at measuring excess fat than BMI, which doesn't really differentiate between fat and muscle weight. It could also be useful for patients who don't have access to a scale — says Richard Bergman, head of a team of scientists who found BAI to be strongly correlated with body fat, "All it requires is a simple calculation that can be done by any health professional including a doctor, nurse, dietitian or personal trainer." If BAI were indeed a measure of health that could be taken with almost no equipment, it would indeed be useful. But Neporent points out that the index doesn't tell doctors anything about "where an individual's fat is deposited." It also doesn't directly measure medical problems. Some markers of cardiovascular well-being — like, say a cholesterol test — require materials that likely aren't present in places that don't have scales. But to test blood pressure, all you need is a cuff, and the test itself is arguably easier than measuring someone's hips and then performing a calculation. A measure of body fat without regard to weight might have some use in a clinical setting, but if what we really care about is preventing heart attacks, strokes, diabetes and the like, it might be better to focus specifically on these ailments, rather than continuing to use body size as a proxy for them.